NEW YORK CITY — The number of guns taken off the streets by the NYPD has fallen to a new low as gun violence jumped since Mayor Bill de Blasio took office this year, DNAinfo New York has learned. Police statistics show 1,935 guns were seized this year in the city as of Aug. 17 — a 2 percent drop over the same period last year when 1,975 weapons were recovered. While the decline is not dramatic, it continues a steep four-year downturn that some observers believe is linked to the plunge in stop-and-frisks as well as a reluctance of officers to engage the public since an inspector general was created to monitor the NYPD amid sharp criticism of its actions. If the decline continues this year, roughly 2,840 guns will be seized, which is 1,050 fewer guns than in 2009 and 1,200 fewer than in 2002 when 4,069 guns were confiscated. At the same time, the number of shootings in the city this year has jumped by 10.3 percent as of Aug. 17, with 730 incidents reported compared to 662 last year. De Blasio announced last week that he would spend $12.7 million to prevent gun violence by expanding a pilot program using “violence interrupters” — primarily ex-gang members — to intervene in street disputes before they escalate. “It aims to prevent violence before it happens . . . to get this stopped before the police even have to become involved,” de Blasio said, noting that the NYPD will send additional officers to precincts where there have been upturns in gun violence. But the former NYPD official — who was also critical of the Bloomberg and Ray Kelly era of aggressive policing that led to a 600 percent jump in stop-and-frisks and about 400,000 arrests a year — was skeptical of de Blasio’s new strategy. “Violent interrupters? What is that?” the source asked. "This weekend was the Wild West. And I believe that's because of the lack of stop-and-frisks combined with the sense that there is a mayor who is sympathetic with disrespect for police. “He would disagree, but I think there is not an understanding of the circumstances for criminal activity." Police Commissioner Bill Bratton has said recently he wants NYPD brass to determine if the city’s upturn in gun violence is tied to the drop of stop-and-frisks, which has plunged from a record 685,724 in 2011, to 191,538 last year, to 27,000 during the first half of this year. 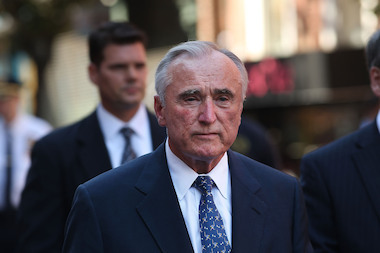 For his part, Bratton has said he does not believe there will be a link. He is trying to target gun violence by zeroing in on gangs and drug dealers who are largely responsible for the shootings. In fact, despite the drops in stop-and-frisks and gun seizures, crime overall in the Big Apple is down 3 percent this year. A law enforcement source believes the shooting spike comes after a historically low year of gun violence and he does not believe the NYPD has taken its feet off the pedal when it comes to going after guns . He thinks criminals are just pulling them when they want to use them rather them carrying a gun all the time. “They are waiting for the right time to bring out their guns when they think the coast is clear,” he said.